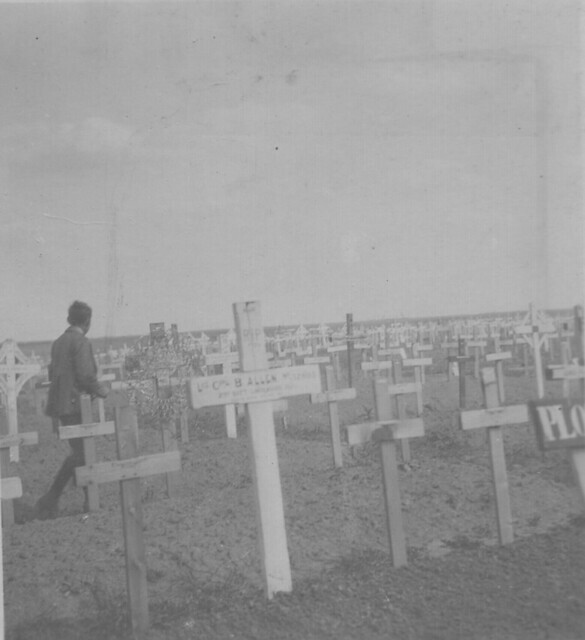 Continuing with the images from the collection of post-war stereo-cards today’s photograph shows ‘Gouzeaucourt Cemetery’. Gouzeaucourt is a large village on the Hindenburg Line battlefields reached by the British in early 1917 and fought over in the Battle of Cambrai that year and in much of the fighting of 1918. There are a number of cemeteries in the area but a good clue here is the grave visible towards the front, where a name is clearly visible. Research shows this is the grave of L/Cpl B.S. Allen of the 2nd Lincolnshire Regiment who died here on 2nd April 1917 and is buried in what is now Gouzeaucourt New British Cemetery. The cemeteries remained in this original state well into the mid-1920s and in some cases well into the 30s. The majority of the original crosses were burned when replaced with headstones but some families came to claim them and others did so by post; many exist as war memorials in parish churches around Great Britain. This entry was posted on 28/03/2012 by sommecourt. It was filed under Aftermath, Battlefields, France, Hindenburg Line, War Cemetery, Western Front, WW1 and was tagged with Aftermath, Cemetery, Gouzeaucourt, Hindenburg Line, War Cemetery.